Sat. 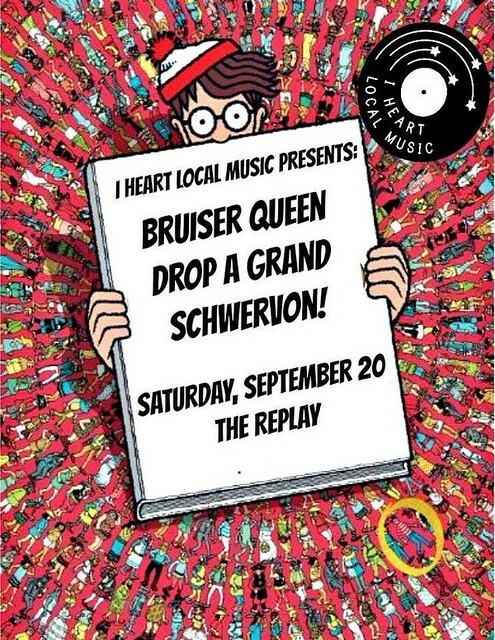 Sept. 20th “I HEART LOCL MUSIC NIGHT” @ Replay Lounge (Lawrence, KS) w/ Bruiser Queen + Drop A Grand | Schwervon! ← Weirdo Wednesday Supper Club! 9/17/14 + the wedding of Kate Blackman & Sherman Breneman! Schwervon! is playing with the the amazing Bruiser Queen from St. Louis, this Saturday, at the Replay Lounge in Lawrence, KS. Also on the bill the masked rockiness of Drop A Grand. The fun starts at 10pm! All of this fun is brought to you by the best local music photo blog in town: I HEART LOCAL MUSIC! This entry was posted in Uncategorized and tagged Bruiser Queen, Drop A Grand, I heart local music, KS, Lawrence, Lawrence Field Day Fest, Replay Lounge. Bookmark the permalink.